Jan Jämsén, an artist who incorporates ritual Shamanic practices into his life experience and art making. Joan Kelly, an artist who uses art to facilitate communication between dominant and minority communities. Jämsén and Kelly came together to play a version of the Surrealist André Breton’s “Le cadavre exquis boira le vin nouveau” in a game of exchange and response between Finnish women with disabilites and Singaporean engineering and art students. Each group listened in a concentrated way to a recording of Shamanic drumming inviting a subconscious vision. The students laid down on the floor in the dark. After listening to the drumming, they wrote what they experienced. Afterwards heading to their easels to put paint to canvas, bring their visions into tangible form. The women listened to the drumming and immediately began to paint, some painting to the rhythm with their whole body. The paintings from this experience can be seen in this exhibition. As a finale both groups met virtually through a dynamic sharing session on SKYPE. Everyone was amazed at what we could learn from each other. Jan Jämsén är en bildkonstnär vars konst influeras av shamanistiska rituella övningar. Bildkonstnären Joan Kelly använder konst för att underlätta kommunikation mellan majoritets- och minoritetsgrupper. Jämsén och Kelly har i sitt samarbete genomfört en version av surrealisten André Bretons “Le cadavre exquis le vin nouveau” genom konstutbyte och respons mellan finländska kvinnor med funktionsnedsättning och singaporianska ingenjörs- och konststuderande. Bägge grupperna lyssnade koncentrerat till en inspelning av en shamantrumma, som kan framkalla upplevelser ur det undermedvetna. De singaporianska studerandena låg på golvet i mörker medan de lyssnade. Efteråt uttryckte de sina visioner genom att måla på tyg. De finländska kvinnorna lyssnade på trummandet och började genast måla, vissa kände trummans rytm i kroppen medan de målade. I den här utställningen finns målningar från bägge grupper. Som en avslutning träffades grupperna virtuellt via Skype. Alla var häpna över hur mycket vi kunde lära oss av varandra. Jan Jämsén on kuvatataiteilija joka saa taiteeseensa vaikutteita shamanismin harjoittamisesta. Kuvataiteilija Joan Kelly käyttää taidetta enemmistö- ja vähemmistöryhmien kommunikaation helpottamiseen ja luomiseen. Jämsén ja Kelly ovat yhteistyössään versioineet surrealisti André Bretonin “Le cadavre exquis nouveau” peliä, suorittaessaan taidevaihtoa ja palauteyhteydenpitoa suomalaisten kehitysvammaisten naisten sekä singaporelaisten insinööri- ja taideopiskelijoiden välillä. Molemmat ryhmät kuuntelivat keskittyneesti shamaanirumpuäänitettä, joka voi tuoda kokemuksia alitajunnasta. Singaporelaiset opiskelijat asettuivat makuulle pimeään huoneeseen kuunnellakseen äänitettä. Tämän jälkeen he ryhtyivät maalamaan kankaille. Suomalaiset naiset kuuntelivat rummutusta ja ryhtyivät välittömästi maalamaan, osa heistä sanoi tuntevansa rummun rytmin ruumiissaan maalatessa. Tässä näyttelyssä on esillä molempien ryhmien maalauksia. Lopuksi molemmat ryhmät tapasivat virtuaalisesti Skypen välityksellä. Kaikki olivat hämmästyneitä siitä miten paljon voimme oppia toisistamme. I am a visual artist from Raseborg. Mainly I work with archaic forms through paintings, installations, and photography. Storytelling, nature, and mythology are subjects that appear continuously in my work. A spiritual though non-religious element is present in my work. I see the process as a ritual. Forms and imagery appear from the otherness and it fascinates me. I have often worked with children and young adults in the form of workshops and other events in schools, and have participated in similar larger-scale symposiums and art events. I have also been an art teacher in an elementary school. I am excited to be a part of ISEAS because it seems like an interesting project that will connect artists from all over the planet to inspire each other and the people of Raseborg. Joan Marie Kelly has been living in Singapore and teaching Art since 2005 as a Senior Lecturer at Nanyang Technological University in Singapore. She is a member artist of Blue Mountain Gallery, one of New York’s longest running artists’ cooperatives, now located in Chelsea heart of the art district in New York City. She has pursued a career of art making, as objects; paintings and ceramics. Yet Asia inspired her to develop a social art practice where she refers to herself as an Urban Ecologist, one who investigates the ecosystem of the city initiating artistic encounters with migrant and marginalized communities. Art became a means to witness the environments and daily lives of communities that are often represented by constructions of the media. She has conducted social art workshops in neighbourhoods of Kolkata, Shenzhen and Singapore, empowering people through creativity, often the experience inspires her paintings. 2017, she is the 2nd prize winner in the Glover Painting Prize, Australia. Her recent solo exhibitions were held in Blue Mountain Gallery New York City, Smith College USA, New Delhi India, and Fez Morocco. Recent Biennale’s include, Beijing, Izmir, Turkey, Korea, and Casablanca. A 2012 publication “Zones of Contact: The Public Art of Joan Marie Kelly” includes an essay by New York Art critic David Cohen and 30 colour photographs of her paintings. Dagtek Arts & Crafts is part of the Kårkulla joint municipal activities in West Nyland, and it is a part of Dagtek Serviceenheten’s daily activities. Since a restructuring of Dagtek Service unit’s operations in autumn 2014, Dagtek Arts & Crafts worked in its own spaces at Flemingsgatan 1. Now we have just moved into new and more efficient spaces in the Fix house! In the business, a total of 25 users now participate. Most of them have a custom education in the craft and / or art industry. The staff team has 4 supervisors. Our business model is based on four workshops, which our users in different long periods and group configurations work in. Each workshop has a responsible supervisor who is responsible for the operation and coordinates it. The workshops are: Knitting & Weaving / Fabric Printing, Dyeing & Tanning / Sewing & Embroidery / Arts & Ceramics. An important role in our business has the Open MINDS cooperation with VNF (an local art school). Open Minds is a customized education that is ongoing at the school 3 days a week. Open Minds was started five years ago with a 2-year art education 2012-2014, followed by OM’s theater line 2014-2016, and now from the autumn of 2016, OM Media is running. In the course there are 12 people, of whom more than half are from Dagtek Arts & Crafts. One of our supervisors goes with the group to school. The weekly program for Dagtek Arts & Crafts is structured so that Monday-Tuesday-Wednesday we work with more productive work, ie. Planning and manufacturing products for our craft sales. Thursday is a “changeover day” when some of our users chose to work at Dagtek’s other point of business with ex. Subcontracting work, and some users from there participate in various crafts with us. Most of our craftsmen switch to another textile workshop. Fridays we strive to have for the entire craft joint program; Go to exhibitions, etc. In our business, art has finally had a lesser role than we wish it could have. The move (in March 2017) into larger and more effective spaces gives us new opportunities to develop that part! The art aspect is included in all the craft work we do: the planning of colorings in carpets and socks, all fabric printing motifs are based on our craftsmen’s own footage, etc. We do not use finished designs or models, but develop their own. In addition to the craftsmanship in the textile factories, we have been working with art or ceramics for 1-2 days a week. Because of small workshops have been group size up to 5 people at the same time. 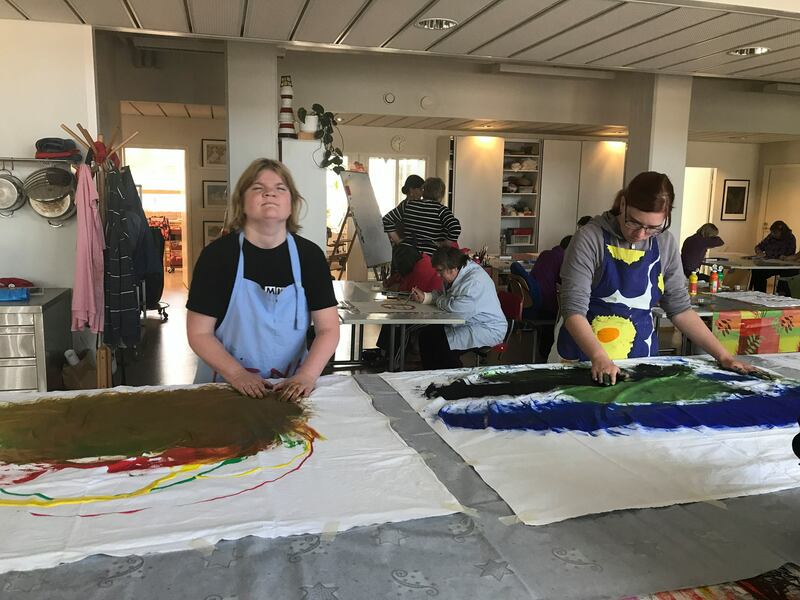 We have participated in some short art courses at VNF ​​with some of our users, and in August 2016 we had a “culture in care” project with artist Magnus Strandberg. We also hope to develop and expand cooperation with MBI. Most of our participants / users have seen different art / course or project activities with “guest draws” as a positive and interesting feature of the business. Some may be a little insecure, reluctant at first but they often choose to come along when they first have a little notice and get an idea of ​​what it means. I / we think that social art can help us grow a stronger community among our users, provide enhanced skills to work together as a group / small groups, provide space and nutrition to dare to be curious, take initiative, express themselves, experiment , Try. And of course, social art can bring joy, new contacts outside our own business unit, new experiences, experiences of success, being involved. Art is a field where all people speak the same language, regardless of disability and other characteristics. What benefit can art give to society? If people feel good and feel involved and significant in society, society is feeling well. See also previous answer. The biggest limitations in including even more art and creativity in our business is a lack of time and lack of money. The work image and time as a supervisor for people with special support is filled with one hundred percent of being present and coached in the practical work of the workshops, as well as in various practical situations that characterize everyday activities. But – we have an interest and motivation, and we work to make more sense in the future. What benefit can art give to society? If people feels good and they feel involved and significant in society, society is feeling well. See also previous answer. We look forward to joy, experimentation and adventure, new networking contacts, positive visibility as active actors :). Dagtek Konst & Hantverk är en del av Kårkulla samkommuns verksamhet i Väst-Nyland, och där en del av Dagtek Serviceenhets dagverksamhet. Sedan en omstrukturering av Dagtek Serviceenhets verksamhet hösten 2014 fungerade Dagtek Konst & Hantverk i egna utrymmen vid Flemingsgatan 1. Nu har vi precis flyttat in i nya och mera ändamålsenliga utrymmen i Fix-huset! I verksamheten deltar nu sammanlagt 25 brukare. De flesta av dem har en anpassad utbildning inom hantverks- och/eller konstbranschen. I personalteamet finns 4 handledare. Vår verksamhetsmodell baserar sig på fyra verkstäder, som våra brukare i olika långa perioder och gruppsammansättningar jobbar i. Varje verkstad har en ansvarig handledare, som ansvarar för verksamheten och koordinerar det. Verkstäderna är: Stickning & Vävning/ Tygtryck, Färgning & tovning/ Sömnad & broderi/ Konst & keramik. En viktig roll i vår verksamhet har Open MINDS -samarbetet med VNF(Västra Nylands Folkhögskola). Open Minds är en anpassad utbildning som pågår vid skolan 3 dagar i veckan. Open Minds startades för fem år sedan med en 2-årig konstutbildning 2012-2014, varefter OM teaterlinje 2014-2016 , och nu från hösten 2016 pågår OM Media. I kursen deltar 12 personer, varav drygt hälften från Dagtek Konst & Hantverk. En av våra handledare följer med gruppen till skolan. Veckoprogrammet för Dagtek Konst & Hantverk är uppbyggt så att måndag-tisdag-onsdag jobbar vi med mera produktivt arbete, dvs. planerar och tillverkar produkter till vår hantverksförsäljning. Torsdagen är ”bytesdag”, då en del av våra brukare valt att jobba vid Dagteks andra verksamhetspunkt med ex. underleverantörsarbeten, och några brukare därifrån deltar i olika hantverk hos oss. De flesta av våra hantverkare byter till annan textilverkstad. Fredagarna strävar vi efter att ha för hela hantverket gemensamt program; gå på utställningar mm. Inom vår verksamhet har konsten tillsvidare haft en mindre roll än vad vi önskar att den kunde få. Flyttningen (i mars 2017) till större och mera ändamålsenliga utrymmen ger oss nya möjligheter att utveckla den delen! Konst-aspekten finns med i allt hantverksarbete vi gör: planeringen av färgsättningar i mattor och sockor, alla tygtrycksmotiv baserar sig på våra hantverkares eget bildmaterial osv. Vi använder inte färdiga mönster eller modeller, utan utvecklar egna. Förutom hantverksarbetet i textilverkstäderna har vi 1-2-dagar i veckan jobbat med konst eller keramik. Pga. små verkstäder har gruppstorleken varit max 5 personer samtidigt. Vi har deltagit i några korta konstkurser vid VNF med en del av våra brukare, och i augusti 2016 hade vi ett ”kultur i vården” -projekt med konstnär Magnus Strandberg. Vi hoppas också kunna utveckla och utöka samarbetet med MBI. Och nu när jag äntligen efter flyttningen hittade pappret vi fick av Tanja, kan jag också besvara de sista frågorna i det..
De flesta av våra deltagare/brukare har sett olika konst/kurs- eller -projektverksamheter med ”gästdragare” som ett positivt och intressant inslag i verksamheten. En del kan vara lite osäkra > motvilliga i början men också de väljer ofta att komma med, när de först hunnit lite observera och bilda sig en uppfattning om vad det innebär. Jag/vi tänker att social konst kan bidra till att det bland våra brukare växer fram en starkare gemenskap, ge utökade färdigheter att jobba tillsammans som en grupp/smågrupper, ge utrymme och näring för att våga vara nyfiken, ta initiativ, uttrycka sig, experimentera, prova. Och förstås kan social konst ge glädje, nya kontakter utanför vår egen verksamhetsenhet, nya erfarenheter, upplevelser av att lyckas, av att vara delaktig. Konsten är ett fält, där alla människor talar samma språk, oberoende av funktionsnedsättning och andra egenskaper. Vilken nytta kan konsten ge för samhället? Om människor mår bra och känner sig delaktiga och betydelsefulla i samhället, mår samhället bra. Se också föregående svar. Största begränsningarna i att inkludera ännu mera konst och kreativitet i vår verksamhet är väl brist på tid och brist på pengar. Arbetsbilden och -tiden som handledare för människor med behov av särskilt stöd fylls till hundra procent med att vara närvarande och coach i det praktiska arbetet i verkstäderna, samt i olika praktiska situationer som tangerar den dagliga verksamheten. Men – vi har intresse och motivation, och vi jobbar för att i framtiden mera kunna betona konst i vår verksamhet. Våra förväntningar på ISEAS-veckan.. är ganska stora, som kanske går att läsa av föregående svaren. Vi ser fram emot glädje, experiment och äventyr, nya nätverkskontakter, positiv synlighet som aktiva aktörer :).